Negligence is a term that means carelessness or a breach of an obligation. Negligence is used in general language to mean someone was unreasonably lax in fulfilling some obligation. If someone is negligent in the eyes of the law, he or she could face a civil lawsuit or even criminal charges. A parent who leaves a two-year-old child alone in the house in order to go out to a bar and have a good time could face charges for criminal negligence. A person who drives 40 miles over the speed limit in a really dangerous way and who causes a car accident and injures someone could be charged with criminal negligence. 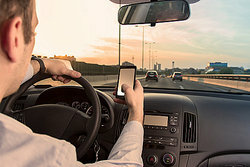 A person who breaks texting-and-driving laws and who is typing a text message when he or she gets into a car accident and kills someone could be considered criminally negligent. A nurse in a nursing home who forgets to feed a patient who needs help to eat, causing the patient to starve to death, could be considered criminally negligent. A caregiver in a hospital who isn't paying attention and who gives someone a deadly dose of a medication could be considered criminally negligent. A doctor who prescribes addictive drugs to a known drug addict because the doctor gets paid for his or her services could be considered criminally negligent. Each state has its own criminal laws that define criminal negligence. Someone charged with criminal negligence could go to jail. When a person is negligent or careless in a way that causes harm to someone else, the victim of the negligence can sue. This is called civil liability or civil negligence. Property owners who let steps to their house crumble and leave a railing unrepaired could be considered negligent if they invites friends over to their house and their friends trip on the railing and steps and hurt themselves. A restaurant owner who mops the slippery floor and doesn't put up a "Wet Floor" sign could be considered negligent. A store that knows things get really out-of-control on Black Friday and who hosts a big sales event, encouraging a mob scene with no security, could be considered negligent. A doctor who operates on the wrong patient or on the wrong body part because he or she misreads the chart could be considered negligent. A company that releases a dangerous drug without fully testing the medication and identifying all of the side effects can be considered negligent. A driver who runs a stop sign and who drives well over the legal speed limit can be considered negligent. A person who owns a dog that he knows is dangerous and who takes the dog to the park where the dog bites a small child could be considered negligent. An employer who fails to follow OSHA guidelines and other workplace safety rules can be considered negligent (although not necessarily subject to a lawsuit because of workers' compensation rules). A lawyer who doesn't really know how to prosecute a case but who takes the case anyway and doesn't adequately represent the client can be considered to be liable for professional negligence. In each of these situations, a plaintiff could file a lawsuit and obtain compensation if he or she can prove the negligence was the direct cause of some type of harm they endured. "Examples of Negligence." YourDictionary, n.d. Web. 23 April 2019. <https://examples.yourdictionary.com/examples-of-negligence.html>.